"Shoofly pie is a moist, dark pie with a crumble top, made with molasses. It is low in fat (the crust contains nearly all the fat), and does not have an overwhelming sweet taste. It can be topped with whipped cream. This is a Southern dish." In a small bowl, mix flour, brown sugar, and butter or margarine together until it resembles course corn meal. Measure out 1/2 cup, and set aside for topping. In a separate bowl, beat the egg. Mix in molasses and cold water. Add crumb mixture, and stir thoroughly. Stir baking soda into hot water, and then add to the molasses mixture. Mix well. Pour filling into pie crust, and evenly sprinkle the reserved topping on top. I have been searching for this recipe for months and was happy to find it. 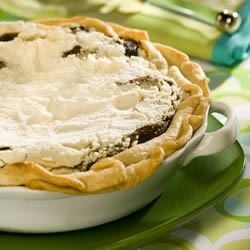 It is one of the most wonderful pies to make if your a molasses fan!